Windows 10 - Get your random questions here! 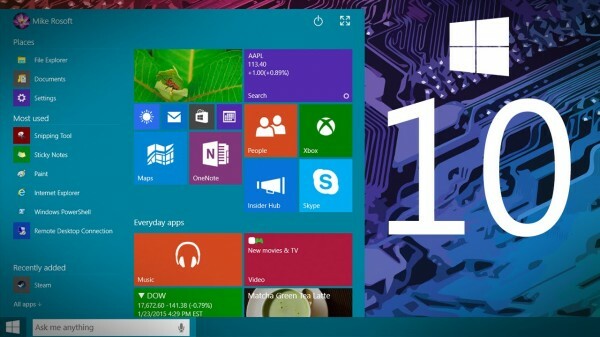 Have you downloaded your free version of Windows 10 yet? For those who have downloaded Windows 10, how much do you like it? Which of these two statements do you think is more likely? Have you found any glitches with Windows 10 yet? If so, what glitches? Music:Klaatu-"Calling Occupants of Interplanetary Craft"
that screen would drive me crazy!!!!!!!!! the thing about mac is you can keep it simple and very low key - restful - and pale grey!!! The funny thing is that I think Microsoft is trying to steal the best things about Macs and add them to their system. If I want dull, drab colours, and a widget/visor system that made no sense, I'd go with OSX. I love dull & drab! Then there are those of us who use windows on a desktop, but would prefer linux and love the Chromebook for light travel and not having to be so concerned about other files. Answer to the 1st question: No, and I can't decide. What's that on the left of the photo? Is it the Start menu, or is it there all the time? It's ugly as sin, but I really only care how it works. Mine doesn't look anything like that. My desktop is the same as it was before except for the toolbar at the bottom of the page, where there are mostly different icons. That's what pops up if you hit the little windows icon in the corner.